SILVER SPRING, Md. --- Last-minute preparations are under way for Annual Council and church leaders have announced that the thornier issues up for debate next week will be settled by way of cage fighting. Although old-fashioned reasoned debate and prayer may have dominated similar meetings in the past, this year's meetings promise a far more action-packed picture. "The Annual Council crowd isn't exactly the picture of physical fitness but most analysts agree that you can taste next week's punishment in the air," said Adventist Yesterday reporter Alf Bengtson. 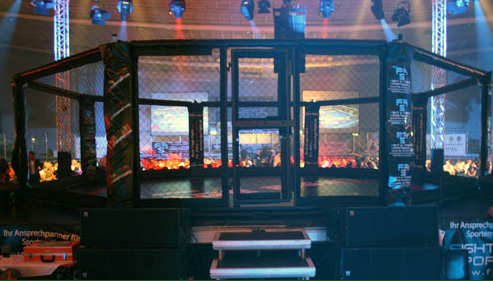 "We are pretty sure there will be some gnarly brawling in that cage." Bengtson said that a lot of the fighters due to attend Annual Council have been well known to throw sharp elbows in the past when push comes to shove. Better yet, tie them up and throw them into the pool. If they sink, they are heretics. If they float, they are theologically correct. I’m REALLY sick of this male dominance belief! ANYTHING they can do, we can do better or as well! WO and MO isn’t even in the Bible. It’s a made up thing by other churches, that SDA’s have adopted! When God gives a gift, he gives it to male and female. No one has the right to interfere with God giving that gift! But, Joy, you don’t want men’s “animal passions” aroused by having a female in the pulpit, do you? “ANYTHING they can do, we can do better”? Oh really? How many master auto mechanics are female? How many pro football players are women? How many professional male boxers are girls? Is this the SDA version of the WWE? Are we gonna wrestle against temptations, etc.? Put me in the square ring next Sabbath after sundown.